Comments: Christian Carstensen (Nee: ) | Indianapolis In US | | Comments: This is Christian Carstensen and his wife Anna Carstensen. They are from Germany. 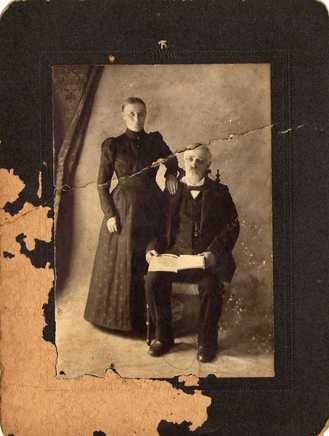 Came to America in 1873, parents of Johanna M. Carstensen Gelderman. Johanna married Edmund Charles Gelderman, and had two girls, May Gelderman Rosier and Marie Helen Thatcher, of Indianapolis Indiana. On the back it says May's grandparents. I don't know the date taken or ages of them.